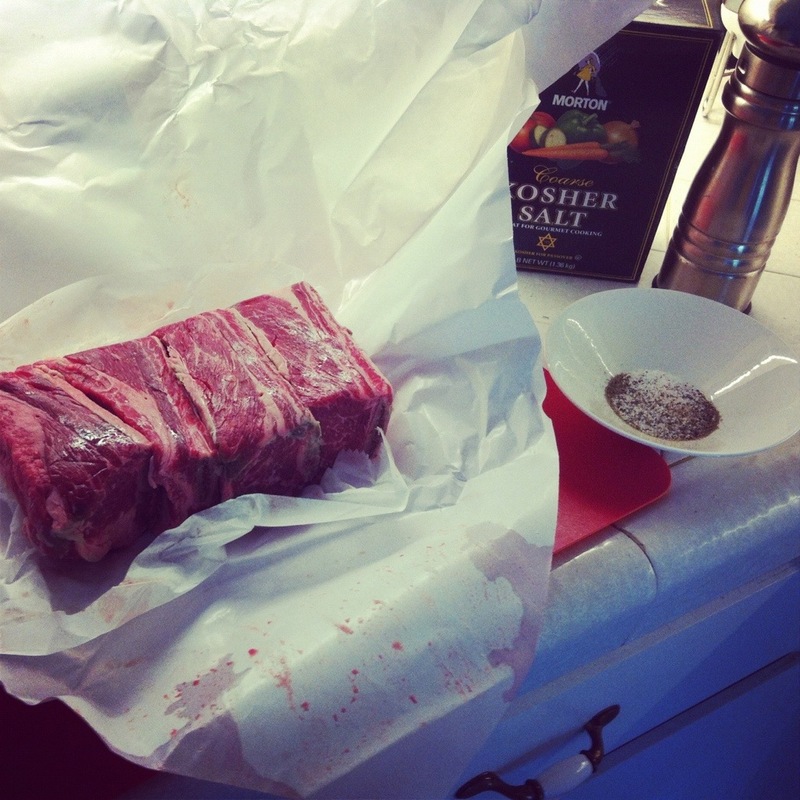 One of my favorite places to shop for meat in San Diego is Seisel’s/Iowa Meat. Generally when I shop I like to go in and see what’s good and on special. The butchers there are knowledgeable and I also like to get their recommendations on what’s tasty and a good value. 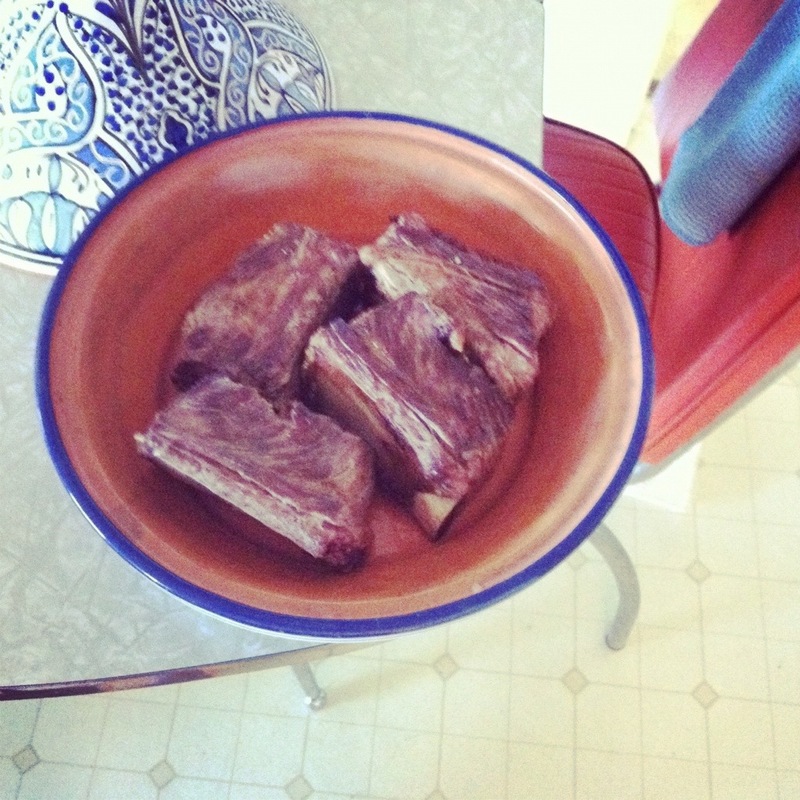 The other day, these prime short ribs at a really low price caught my eye. 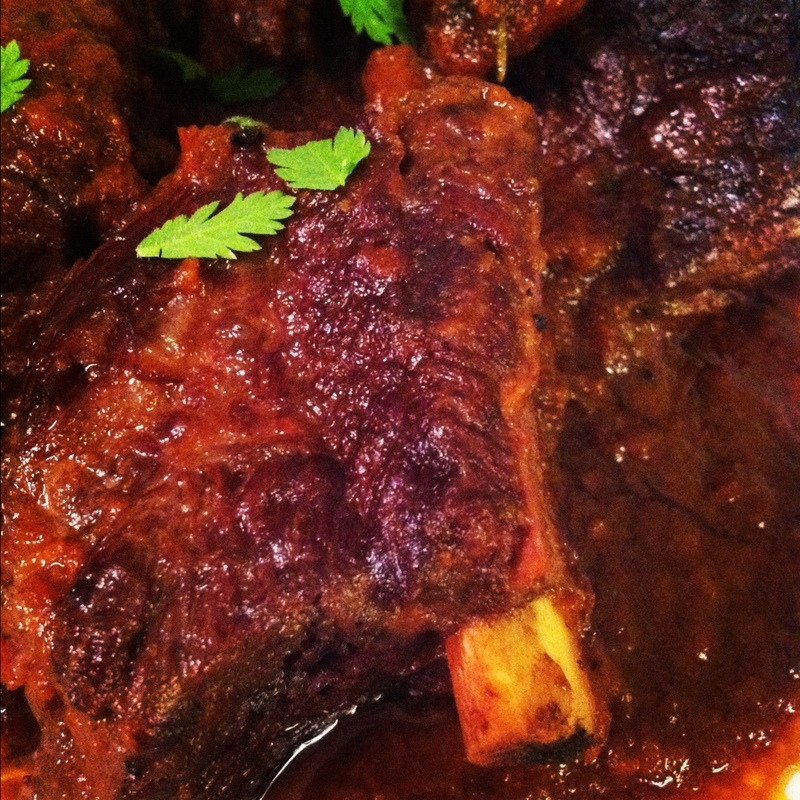 Braised short rib is a restaurant dish my husband and I both like, and I wanted to give them a try. I browsed a few recipes online. Some of them were a little complicated. Sorry, Tom Colicchio, they sound great, but I don’t have two days to make dinner or a week to hunt down the special cut. Sometimes I think some chefs share complicated recipes so that you get impressed, hungry and go to their restaurant instead of actually attempting to recreate them. The rest of them just seemed like variations on making a beef stew, so I just went into the kitchen, but not without misadventure. I had a dutch oven that I have been wanting to use, but nearly started a grease fire by having it on too high of heat. 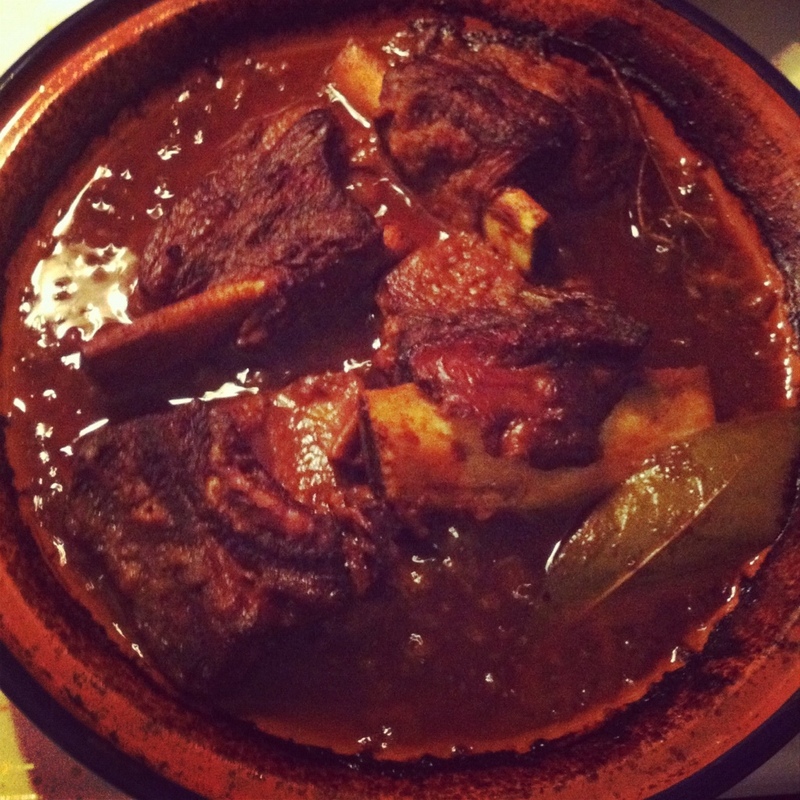 I had to improvise at the last minute, braising the short ribs in a tagine. Here’s what I came up with! Step 4: Brown each side of the meat briefly (just until a fraction of an inch is browned) in a little bit of an oil appropriate for high heat. Be sure to get the “ends” seared too. 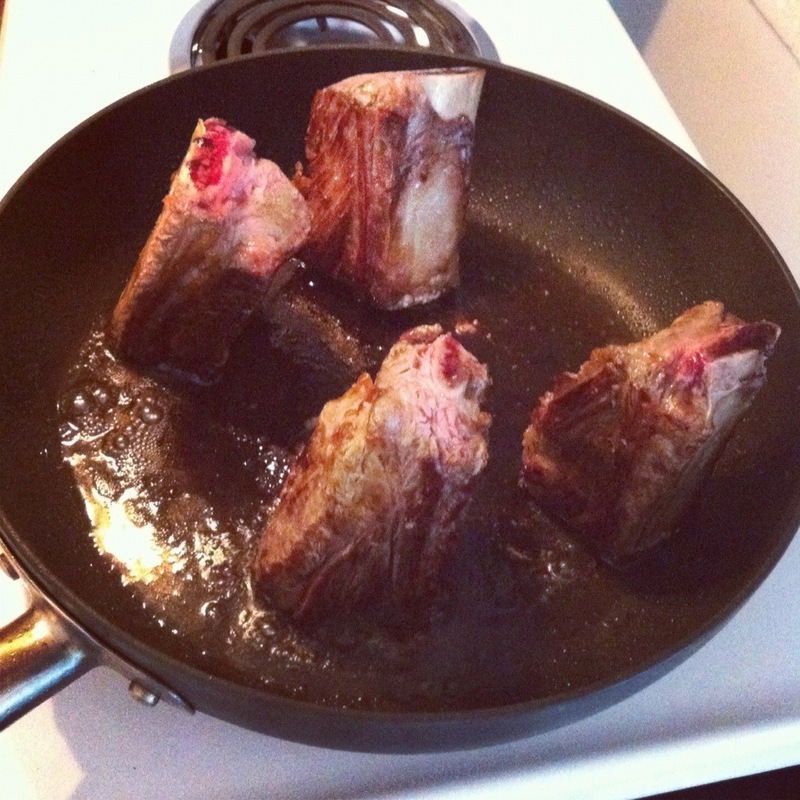 Searing is thought to seal in moisture and the caramelization adds a depth of flavor. 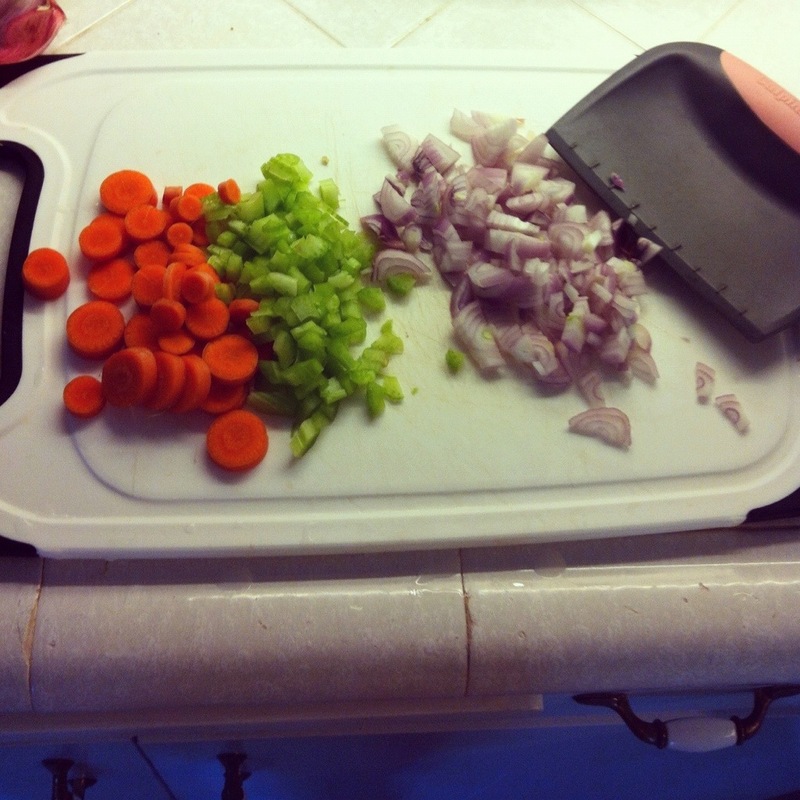 Step 5: While the meat is being seared, chop the carrot, celery, shallot/onion, and garlic. Peel and chop the tomatoes. Step 8: Here is the step that will elevate the dish from simply a stew to fancy pants: Purée the sauce in a blender and then return to the pan. Continue to cook the sauce, until it reduces by half. 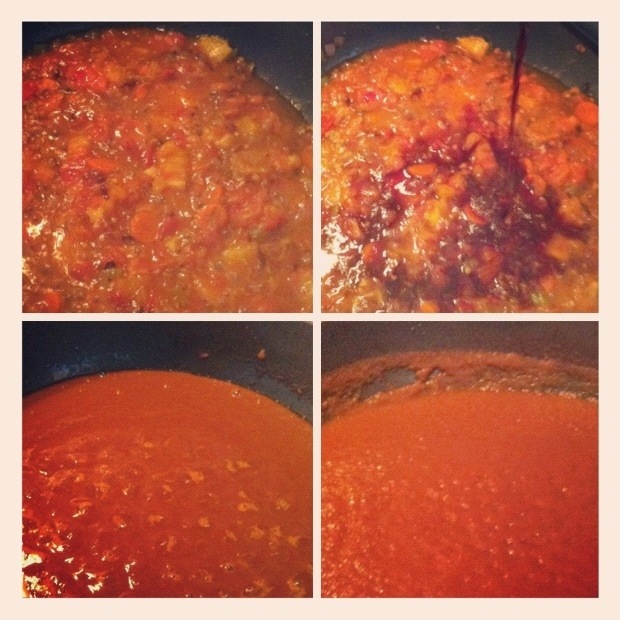 Let the sauce build up a nice thickness on the bottom a few times and then scrape it up with a spatula and mix it in. 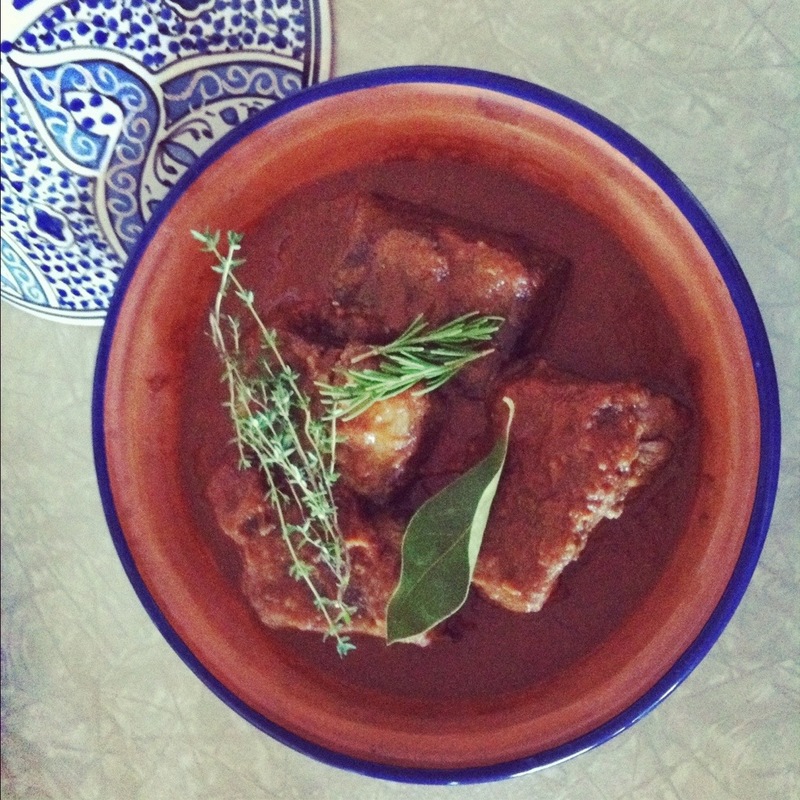 Getting a nice dark sauce is key to mimicking the yummy intensity of restaurant dishes. 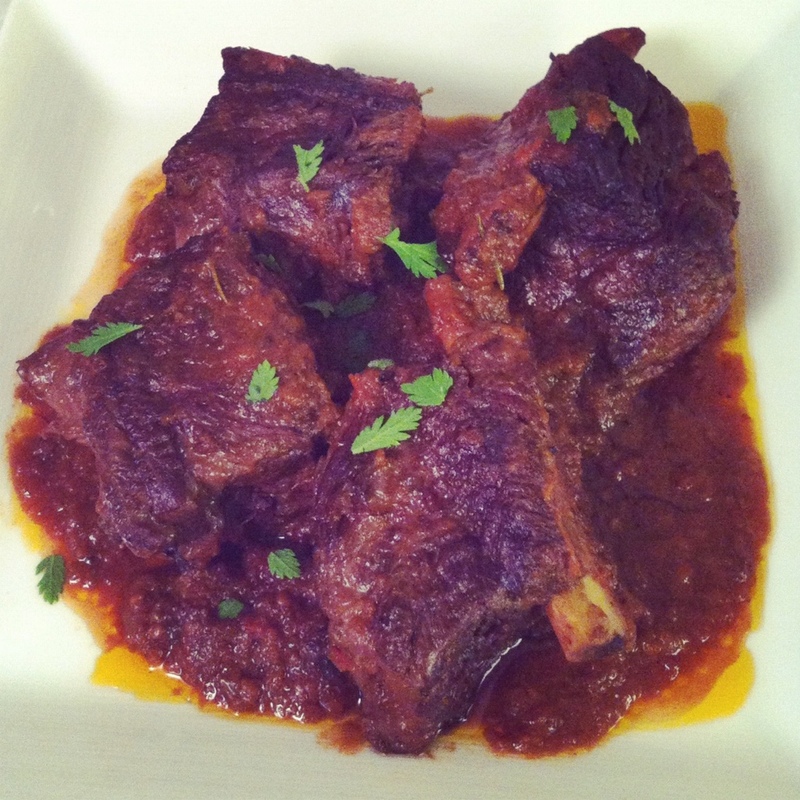 Step 9: Combine the sauce with the meat in your baking dish. Add herbs such as thyme, bay leaf and rosemary. Submerge the herbs in the sauce so they will infuse into it. Coincidentally, the marrow from the bones will also be leaking out and joining the sauce. 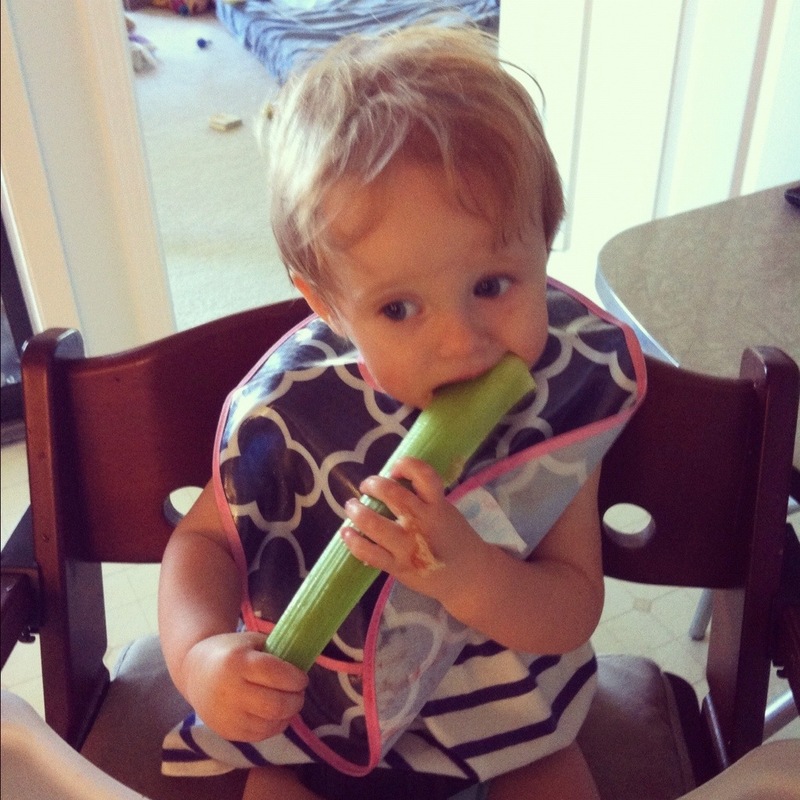 Marrow is filled with nutrients and the one thing I craved while pregnant. The meat literally fell off the bone on half of the ribs. 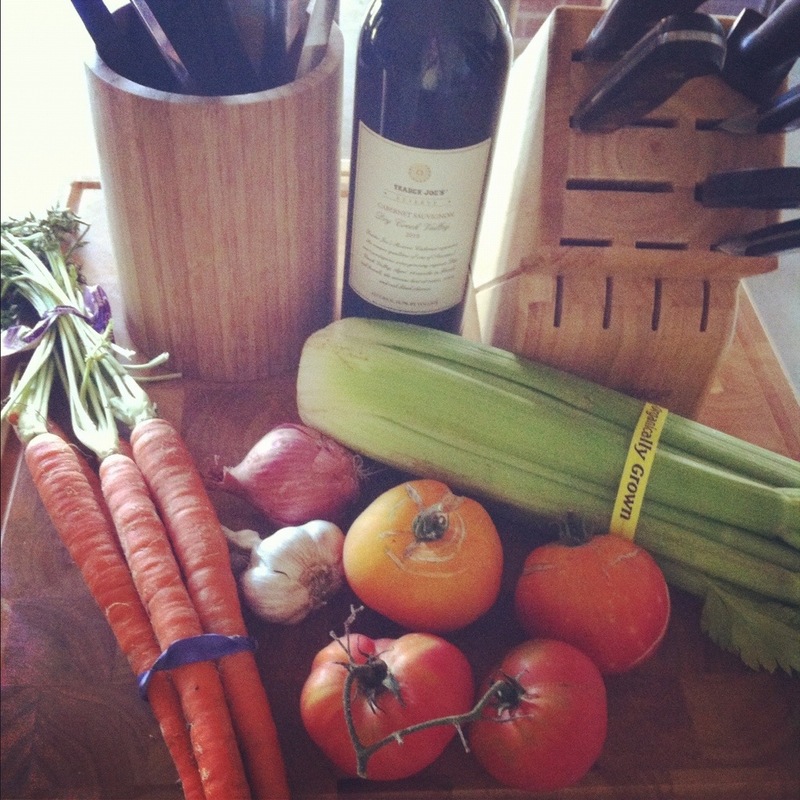 Enjoy with mashed potatoes, roasted potatoes or polenta; a green salad or veggie and a glass of the same red wine. *When I studied Sociology in Spain, the problem of “borachas de la cocina” was discussed. Literally the feminine form of “kitchen drunks,” the term referred to the very serious issue of alcoholic housewives. For some reason the term always struck me as funny. Please be sure that alcoholism is nothing to laugh at, and send me a personal message for any help finding resources… but I do secretly like to reference las borachas de la cocina and giggle when I practice the tradition of drinking a glass of wine while cooking. 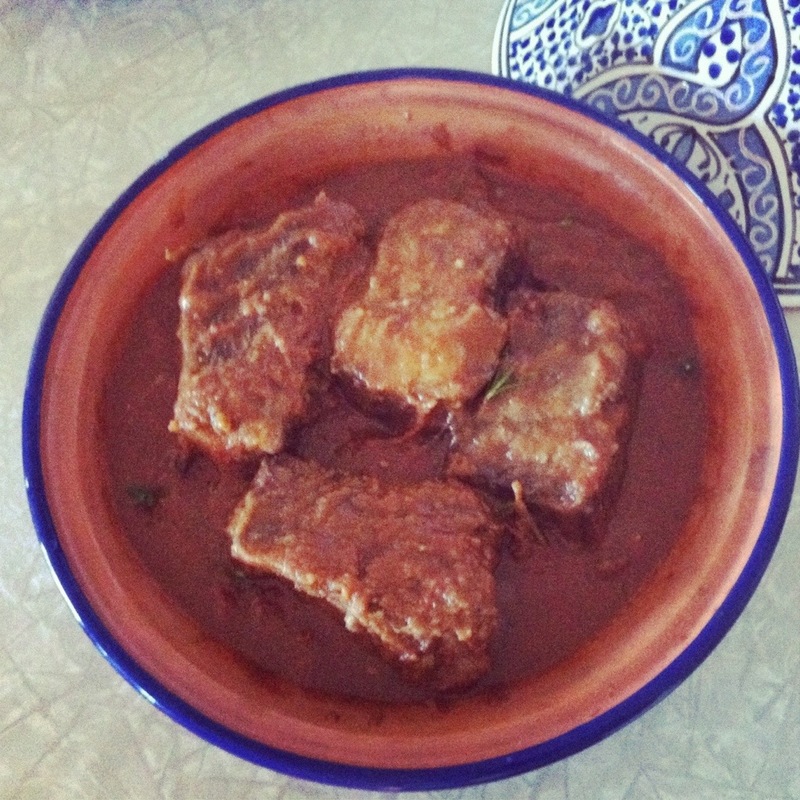 This entry was posted in Food, Step by Step with Pictures and tagged gluten free, paleo. Bookmark the permalink.